I thought I'd give this forum another poke, to see if it stirs! 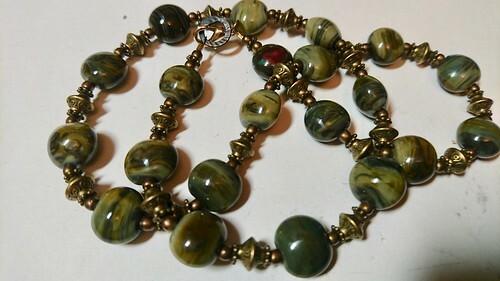 Here's my latest; made from Vetrofond Green Olive. All these colours come from different treatments of the glass - heating less, more, reducing a bit. You can see where I overcooked one a bit and got copper red! Any idea why the forum has gone so quiet? My reason is I took a break from lampworking as I'd lost my mojo. I'm heading to my shed today and if I haven't forgotten everything, will do my best to post the results.